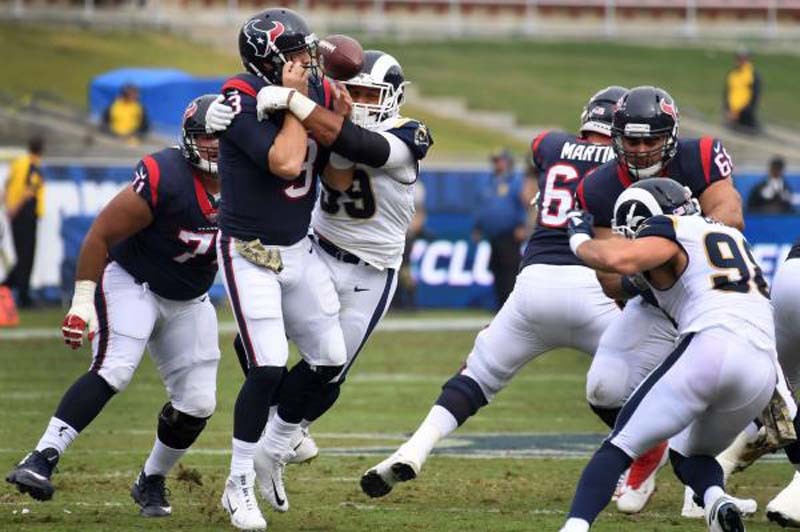 Los Angeles Rams star defensive tackle Aaron Donald has stayed away from the offseason program, but one team official gave a positive assessment of the contract negotiations. Kevin Demoff, the Rams' chief operating officer and vice president, said Tuesday during an event for the team's new stadium that the communication between club officials and Donald's representatives has been "great." The 2017 NFL Defensive Player of the Year, Donald has been seeking a new contract since last year. "I think when you build stadiums like this, it's with players like Aaron Donald in mind," Demoff told the NFL Network. "And we've been at this process, working with them for the past year and a half to try to make sure that Aaron is not only here for the opening of the stadium but plays well into his years. And that he can play in the 2022 Super Bowl in his own home stadium." Donald is slated to make $6.89 million in the fifth-year option of his rookie contract. He skipped both the voluntary workouts and mandatory minicamp. "We're working on it and we'll keep pushing forward," said Demoff. "The dialogue's been great. It's been positive. I think [Donald] and coach [Sean] McVay have a terrific relationship. We look forward to getting this done. And putting Aaron in the place where he should be among the highest-paid defensive players." Donald was the first Rams player to earn Defensive Player of the Year honors after he amassed 52 tackles, a team-high 11 sacks, a club-best five forced fumbles, 27 quarterback hits, one fumble recovery and two passes defensed in 14 games last season. The former University of Pittsburgh standout also was named first-team All-Pro for the third straight year and to the Pro Bowl for the fourth year in a row. Donald has totaled 148 solo tackles and 39 sacks since entering the league in 2014. Demoff did not put a timetable on when he hoped to have negotiations wrapped up on a new contract for Donald. "Well, it will be done before the stadium's done," Demoff said jokingly. "Nah, we're going to keep wishing and hoping. I hope it's done sooner than training camp, but if it goes to training camp, our goal is to make sure it's done and that he feels rewarded and that it's a win-win deal for both sides."